Simon & Schuster, 9781451649284, 256pp. In the tradition of The Year of Magical Thinking and What Remains, this breathtaking memoir by a young Army widow shares her heartbreaking, candid story about recovering from her husband's death. In this powerful memoir, a young woman loses her husband twenty years after her own mother was widowed, and overcomes two generations of tragedy to discover that both hope and love endure. Artis Henderson was a free-spirited young woman with dreams of traveling the world and one day becoming a writer. Marrying a conservative Texan soldier and becoming an Army wife was never part of her plan, but when she met Miles, Artis threw caution to the wind and moved with him to a series of Army bases in dusty southern towns, far from the exotic future of her dreams. If this was true love, she was ready to embrace it. But when Miles was training and Artis was left alone, her feelings of isolation and anxiety competed with the warmth and unconditional acceptance she’d found with Miles. She made few friends among the other Army wives. In some ways these were the only women who could truly empathize with her lonely, often fearful existence— yet they kept their distance, perhaps sensing the great potential for heartbreak among their number. It did not take long for a wife’s worst fears to come true. On November 6, 2006, the Apache helicopter carrying Miles crashed in Iraq, leaving twenty-six-year-old Artis—in official military terms—an “unremarried widow.” A role, she later realized, that her mother had been preparing her for for most of her life. 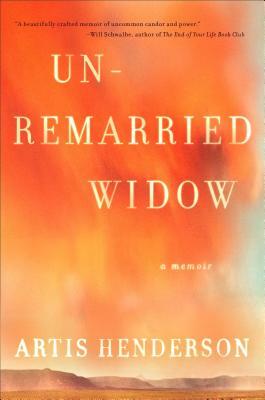 In this memoir Artis recounts not only the unlikely love story she shared with Miles and her unfathomable recovery in the wake of his death— from the dark hours following the military notification to the first fumbling attempts at new love—but also reveals how Miles’s death mirrored her father’s death in a plane crash, which Artis survived when she was five years old and which left her own mother a young widow. In impeccable prose, Artis chronicles the years bookended by the loss of these men—each of whom she knew for only a short time but who had a profound impact on her life and on the woman she has become. Artis Henderson is an award-winning journalist and essayist whose work has appeared in The New York Times, Reader’s Digest, Florida Weekly, and the online literary journal Common Ties. She has an undergraduate degree from the University of Pennsylvania and a graduate degree from Columbia University’s School of Journalism. She lives in New York. "A frank, poignant memoir about an unlikely marriage, a tragic death in Iraq and the soul-testing work of picking up the pieces." “Artis Henderson makes her debut with this poignant, deeply felt memoir about the death of her young solider-husband." "Charm and candor reside in abundance. . . . A singular, transformative account."